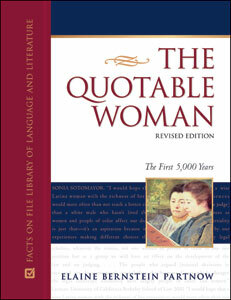 The Quotable Woman, Revised Edition gathers nearly 20,000 great quotations from more than 5,000 women throughout history, beginning with Eve and continuing to the present day. Thoroughly revised and updated, this book is a treasure trove of both familiar and unexpected quotations on nearly every subject imaginable, including friendship, love, politics, religion, education, the arts, and women's role in society. Contributors are presented in chronological order by the year of their birth, then alphabetically within each year. Indexes allow readers to find quotations by subject and contributors by name, occupation/profession, and nationality/ethnicity. Many more quotations from women in Africa, Asia, and the Middle East.